Creating a complete environment that "screams Fanatics" for the 2018 sales meeting event at the Hilton Orlando Bonnet Creek Hotel. 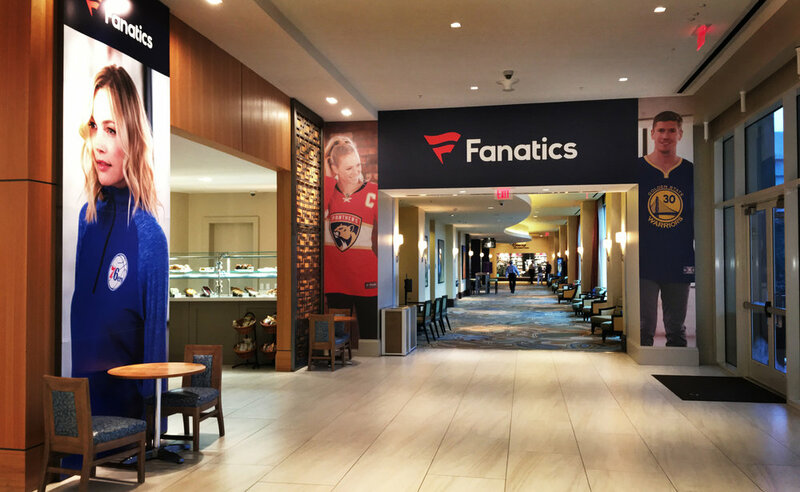 Transforming the meeting location at the hotel space to serve as a Fanatics branded team experience. To create a brand environment designed to help unify the Fanatics sales team, celebrate Fanatics' history, and showcase their strategic partnerships and merchandise lines for FY18. The Fanatics Executives & entire sales force. The strategy was to create an exciting experience for each employee from the moment they stepped into the hotel lobby, continuing through hallways, throughout the grand ballroom and extending through multiple breakout rooms. Clean, simple structures to showcase all apparel as the main focal point. White pedestals and metal risers were combined with strategic lighting to highlight the hottest new garments going to market. By placing a pop-up Sports bar within the space, we created an exciting place for attendees of the meeting to share the same feelings as a sports fan, all while learning about the newest products. All attendees were impressed with the extent of the branding throughout the entire hotel. All aspects of the environment were created in 21 days or less. As one employee stated, “You’ve entered the Fanatics hotel, not the Hilton".